Well... here we are at the end of the funnest day of the year. We had another amazing Sunday Funday today! If you haven't already, please check out our live video at www.facebook.com/yfcsask We took about 20 min. of live footage from today and we would love for you to see it! I started today by going to the home to pick up the kids and bring them back to YWAM. When I arrived I found them all dressed in their nice clothes, backpacks ready, standing with their little faces pressed up against the glass door waiting for me. I yelled 'who's ready for Sunday Funday' and I heard a lot of screams in response. I brought them back to the base and they were greeted by our team with decorations and toys ready to play! We spent a couple of hours just playing and playing and playing before lunch. It is always amazing to watch the kids just run around without a care in the world having the time of their lives. At noon my friend Shenny served us up an insane amount of fried chicken, nachos and cheese, and juice. The kids love to enjoy the luxuries of things like ketchup and hot sauce, and once their chicken was done they were eating the ketchup with a spoon. Once their bellies were full, we started up the slip n slide while the older kids played a game of soccer. I don't have enough words to describe how much these kids love a slip n slide. If you check out our Facebook video you'll see that it is a lot of crazy chaotic fun. We start by kind of standing in a line. We end by kids rolling around in soap. It's awesome, and a simple thing like a piece of plastic and some body wash brings them an incredible amount of joy. After the slip n' slide it was time for ice cream sundaes! It was another highlight to watch the kids each receive a huge bowl of ice cream with all the toppings. Ice cream is a big treat here as it is quite expensive, so every single bite was thoroughly enjoyed. After the slip n slide and ice cream it was time to wrap it up, and I started shuttling the kids back home. We were able to give each of them a little gift bag with some treats and a toothbrush and toothpaste. Each one of them said thank you so many times, they were truly feeling blessed by such a fun day. The team did amazing. Today was the hottest day we have had so far, and running around and playing is intense in this heat. But they embraced every second, and were always willing to jump up and help when it came to serving lunch and cleaning up. Be proud of these kids! They are doing great things and working so incredibly hard. After the clean up we were able to rest for about an hour, and then we headed to church this evening. 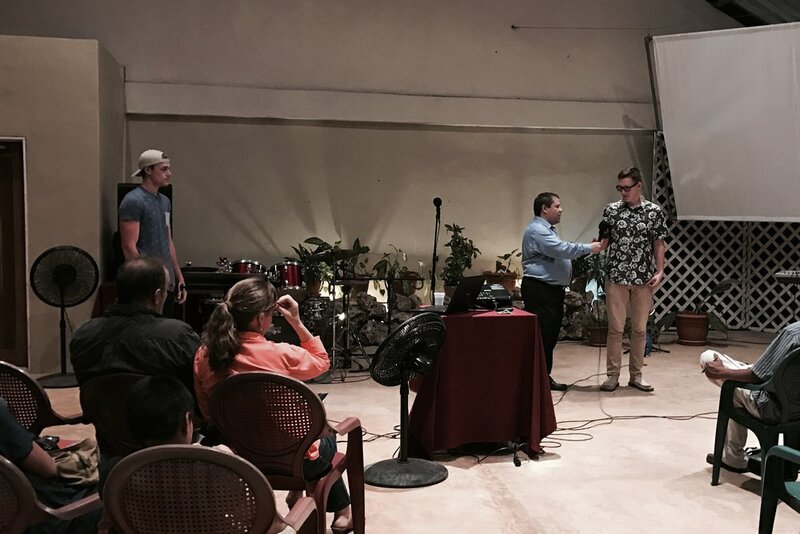 Church in Belize is always a fun experience. The music if very lively and has a Caribbean vibe, and the people here worship very openly and freely. 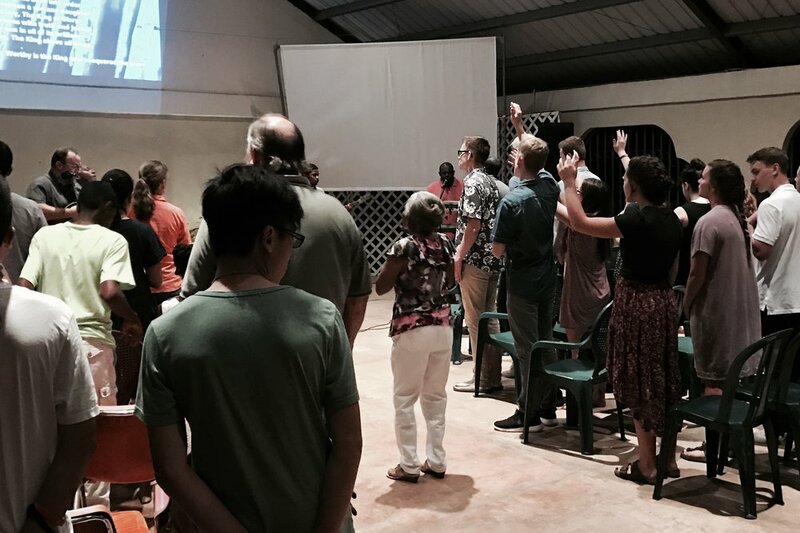 The kids really enjoyed the atmosphere, and were able to really connect with God through the worship time. There was a guest speaker tonight, who had so many good things to say about the Church and how God has asked us to live to be a light in the world. He asked Braydon and Gavin to come up and help him with an object lesson, and they were so funny they had the whole church cracking up. At the end of the message the pastor turned right to our team and told them that God was speaking to him to tell the team that God has great things in store for each one of them. He had a very good word for them, and was speaking into each of their lives specifically which was powerful of them to hear. It was an awesome and encouraging way to end the day, and once again the team came home so happy tonight as we had our debrief time. Tomorrow we are back at the work site, beginning the concrete prep for the pour on Wednesday. We will then stay at the home for supper and family devotion time. It seems like we just got here, but I know from experience that this week will go very very fast. We are trying to soak up every minute that we have left here. -Izzy's ankle was very swollen this morning, so I got Mr. Santi from the base to take him to the doctor to get it checked. I wanted to make sure it wasn't an infection of some kind, but they checked him out and did some x rays just to make sure, and it turns out it's a bad sprain. We are getting him to ice it and stay off it, but please pray for quick healing for him as I'm sure it's frustrating to have to stay off your feet with so much going on. Sofia's ankle is doing much better! -Pray that the words that were spoken at church tonight can take root, and God can continue working in the hearts of our team. -Pray for safety tomorrow as we work, and for protection against heat stroke. Or maybe even pray that it wouldn't have to be QUITE so hot as we work. Thank you for all your comments and love and prayers and support! We love to hear from you, and are glad you're enjoying the blog and videos. It's fun to be able to share this experience with all of you.